So much to say about Framingham, MA. Its lively, hip, and will always keep you on your feet. Many homes in Framingham need a little tender, love and care and one of our many customers who reside in the town agreed. 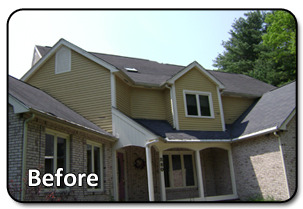 Their old, cracked and mustard yellow siding was just bringing down the beautiful lines of the home and the homeowners couldn't agree more so they decided to make the switch. 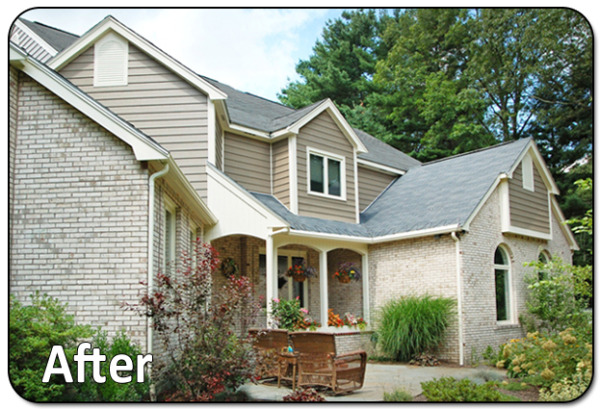 They were introduced to Everlast Composite Siding and right away they knew that no other product could provide the value that they were going to receive. Their home required a complete demolition of the front's old vinyl siding and as well all soffits, corners and trims were renewed during the project. The owners were ecstatic to see the final product of Chestnut colored Everlast Composite siding completed on their home and were far beyond pleased with the final result.